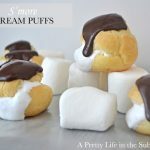 These S’more Cream Puffs are a delicious twist on a classic recipe! Grate your chocolate squares. And put into a bowl. Set aside. In a saucepan, simmer your 2/3 cup cream for a few minutes, just so it’s nice and hot. Pour the cream over the chocolate. Don’t stir it yet – let it sit and just wait for about 2 minutes. Then gently stir. Let sit again for 2 minutes. Stir gently again until fully combined. I think this is to prevent bubbles. Once your cream puffs are made and cooled completely, fill them with Marshmallow Fluff. I just scoop the fluff into a ziplock bag, snip one of the bottom corners off, and pipe it in. Pour/drizzle on some ganache. As little or as much as you would like. Gather friends or family, and devour.